After 7 years on the YNPN board I’m stepping down and moving on.. One of my last events as a part of the YNPN board is the Luau Happy Hour at Boardwalk and 19+ people attended. It wasn’t our greatest moment but what a difference from the first few happy hours we had with just one or two attendees. As one of my outgoing duties I wrote this little ditty, which was published originally on the YNPNGR Website. YNPN has been a great experience that I would have never participated in if Barbara Anderson hadn’t invited me to attend a planning meeting 7 years ago. We are (both) still here and officially have become YNPN senior citizens. Over that time I’ve met rad people, honed some marketing skills, recruited fresh faces, organized monthly events, helped plan a few extravaganzas (including a national conference), launched multiple annual awards events and several top-shelf nonprofit “geek” events. So after all of those experiences and all that time, these are some of the lessons I’m taking with me. Embrace your inner nerd. 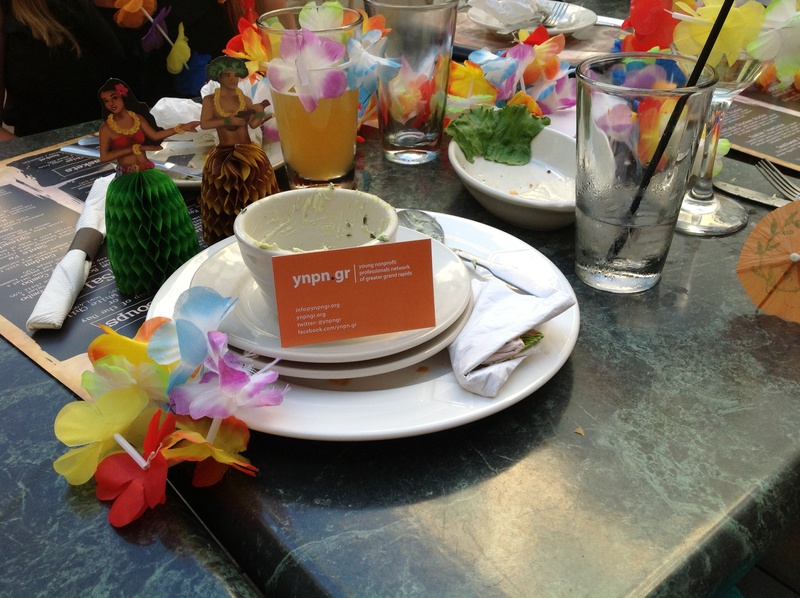 Granted, you may have joined YNPN to make connections, grow your career or straight find a job, and that’s totally cool. But there is so much more going on! The nonprofit sector in Grand Rapids is awesome, there is sweet work happening all around you. Figure out what elements make those projects so epic and geekout about it. Share it, celebrate it, emulate it. Don’t be scared. Let’s face it -if we aren’t talking the real talk – then we are being wusses. There are so many broken, messed up, totally jacked issues in the sector. if we aren’t taking the time to chat about them, how can we event begin to change them? Be concerned, talk about issues and find ways to make small inroads to new options: for your peers, for the sector and for your clients. Keep it creative. Being nerdy and being brave are only a part of the picture: the next step is thinking outside the box. This part is really hard. How do you figure out stuff that nobody has ever thought of before? Whatever process YOU use to get the creative juices flowing, get on it and work BOTH sides of that brain. Just ask. There are so many acronyms and jargon; how are you supposed to remember all of those peoples’ names? If you don’t know what someone is talking about, then ask them. Sure,you can Google it later, but why wait? We all start as strangers. And then we become colleagues, peers and oh yeah…. Friends! I’ve met awesome people from across the sector through YNPN events, boards and committees. The key is to show up, shake hands and say your name. Do the unexpected. It’s easy to be boring. So if it seems like things are coasting along at a comfortable pace, it might just be that you’ve gotten lazy. Use “easy” to indicate when it’s time to push harder, think bigger and get radical. Trust people and authorize awesome. YNPN is an all-volunteer organization. Figure out what jobs need to get done and ask people to do them. Pay attention to details without being a control freak. We need to create fewer barriers for involvement, not more. We aren’t going to agree all the time. Brawling at board meetings (using polite, respectful language) is a way to determine steps, processes and sometimes clarify vision. It’s important to speak up when you disagree, talk about those differences and THEN try to come to a consensus. Have freaking fun. A large portion of our sector is dealing with super serious issues and no matter what portion of the sector you are in, there are tons of passionate, driven people. Sometimes we forget to have fun, celebrate the awesome, eat pizza, go to the beach, yoga-cize and play mad libs. It’s ok to go to the education event AND the cocktail hour; finding ways to chill makes you better at your job. -Marketing committee members are the best, ever. -If you become a YNPN co-chair, there is like a 95% chance you will get knocked up. -Don’t have board meetings at 7:30am, who can think that early in the morning? -Don’t swear in board meetings, it’s uncouth. -Avoid zombies, they are so freaking scary. -Sock puppets are hilarious and Journey is not just a band. -If you miss 3 board meetings in a row, you are a slacker who should quit OR work double time to make up for it.